Few topics fuel the collective curiosity of our superTTuning crowd as fervently as the discussion of bearings. Despite the fact many of today’s reels come equipped with adequate enough components to get our casting and retrieving duties done, the term “good enough” is rarely adequate amongst our readership. This tutorial continues to build on the fundamentals presented in Reel Bearings � 101 and 201. It covers reel maintenance and design, common bearing problems and troubleshooting, and other related topics. You can be certain that I will disassemble, clean and re-lube a new enthusiast reel shortly after using it. I not only wanted to convert the Steez over to my favorite reel oil/grease, but was also curious about major changes and improvements that had been made in the design and construction of the reel. Reel Bearings - 201 Ready for bearing overload? Everything you wanted to know about fishing reel bearings, including how they are created, and what role they play in reel operation. Class is in session as bearing guru, ChuckE, explains the ins and outs of reel bearings in "Bearings 101." Avet reels are quickly becoming a popular alternative to some of the Tier 1 branded saltwater reels thanks to certain special features. Like all saltwater reels, routine maintenance is a good idea and Alan Tani takes a look at the popular SX model to see just how easy it is. 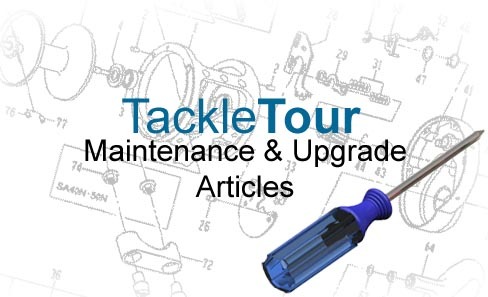 Join ChuckE, TT's latest edition to the "TT Gear Crew," for an extremely detailed "how to" article dedicated to the maintenance of one of the most popular palming baitcasters out there, the Daiwa TD-Sol. Welcome Alan Tani to the TT gear crew! Alan's expertise is reel maintenance and upgrades, and in this tutorial he takes apart one of the most popular bass reel in history, the Bantam Curado 200, and upgrades the drags with Carbontex carbon fiber washers. Ever wanted to soup up those saltwater drags? Alan shows you how when he upgrades a Daiwa Saltist 40 with ultra smooth and powerful Carbontex carbon fiber drag washers. Reel maintenance guru, Alan Tani decides to rebuild and re-lube an Abu-Garcia Record reel. Step by step he breaks the reel apart to access all the key lubrication points, then proceeds to put it back together in this maintenance tutorial. Sometimes older reels need love too. Alan takes aim at the Sealine 50H and decides to rebuild the reel and get it back running in tip top condition.